PDF Download now available for £2.99 (including £1.00 contribution towards prize fund)! The Oracle is primarily a Treasure Hunt. The reader has the opportunity to discover the whereabouts of a hidden token and claim a cash prize. Somewhere in the United Kingdom, a token is hidden in an area accessible to the general public. Within the pages of the book there are several clues as to the whereabouts of the token. The pages of the book are filled with poems and lavish illustrations, which are a delight in themselves. The reader will take great pleasure in solving the clues that lead to the token. Readers can use the token to visit this website and claim the cash prize. The prize fund is displayed online and increases with the sales of the book. For every copy of the book sold, £1.00 will be donated to the prize fund. The minimum prize fund will be guaranteed to be £5,000. 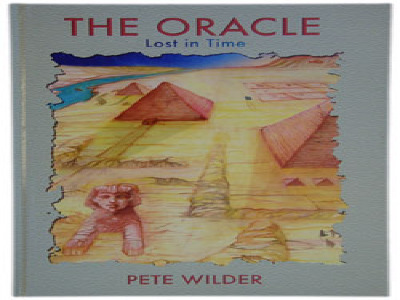 The Oracle is a Space/Time travel adventure, a story designed to enthral children. It is the story of two young brothers, Richard and Jorden. Richard is the older brother aged 14 and Jorden is his pesky sibling aged 5. Richard is a cool laid back character while Jorden is precocious, enquiring and without fear. He leaps before he looks. Richard has more foreboding, he's still game for anything but only after he has fully evaluated the situation. The mischievous boys decide to sneak into their Dad's laboratory to investigate his latest experiment. They are amazed to find what looks like a small flying saucer hovering in mid air and they scamper inside. Jorden accidentally activates the controls, the boys are suddenly flung into a space/time warp encountering distant galaxies and historical events back here on return to planet Earth. The Oracle is Beautifully Illustrated in A4 full colour with A3 centrefold (Russia “From Rasputin to Putin”. The pictures are surreal with a lustrous quality. Thumbnails and A5 images can be viewed here. The Oracle includes Poetry relating to the illustrations in the book. Eloquent and concise, the Poems add an extra dimension to this beautiful book. Rhyming and lyrical, they provide a separate thread to this unique piece of work. The Poems are inspirational, enlightening and will hopefully spur the next generation to a new level of awareness.